Michael Russo of The Athletic reports (subscription required) adds that the deal carries a modified no-trade clause in the final two years of the contract; he is ineligible for one in the first three. The deal more than doubles his $2.75MM salary from last season that also represented his qualifying offer last month. It also makes him the third highest paid player on the team behind blueliner Ryan Suter and winger Zach Parise. It would be tough to argue that he didn’t earn it, however, as he is coming off a stellar performance last season. Dumba played in all 82 games in 2017-18 and posted career highs in goals (14), assists (36), points (50), and average time on ice (23:49), numbers that are reflective of a legitimate top pairing defender. He followed that up with a pair of points in their opening round loss to Winnipeg although his playing time jumped to nearly 27 minutes a night. 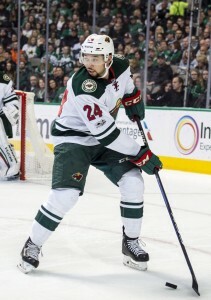 Dumba, Minnesota’s first-round pick in 2012 (seventh overall), has been prone to some untimely giveaways over his first few NHL seasons but if he can maintain close to that level of production throughout the life of this deal, the Wild will certainly be willing to live with some of those mistakes as he is their best offensive threat from the back end. The contract buys out the remainder of Dumba’s RFA years as well as a pair of UFA seasons but will also allow the soon-to-be 24-year-old hit the open market while still being in the prime of his career five years from now. In the meantime, the team now has their top pairing of Suter and Dumba locked up for the next five years. With the signing, Minnesota now has just over $5.6MM in cap space to work with per CapFriendly. Most, if not all of that will be heading to RFA winger Jason Zucker who is coming off a career season that saw him record 33 goals and 31 assists. His arbitration hearing is scheduled for July 28th. Sportsnet’s Elliotte Friedman was first to report (Twitter link) that the contract had been agreed upon. Photo courtesy of USA Today Sports Images. I happy with this. Won’t hurt the cap too bad, and they had to do it. I’m pretty sure he’ll keep getting better.